Mike’s complete training course on CD! Learn the full range of techniques, habits, and word-for-word skills as Mike narrates exactly what it takes to become a Top 20% producer. A bonus CD on how to take your career into the top 1%! This is Mike’s essential, core inside sales training program on CD (available for instant download MP3 also). Contains everything a new rep – and a seasoned pro – needs to catapult their career to success. 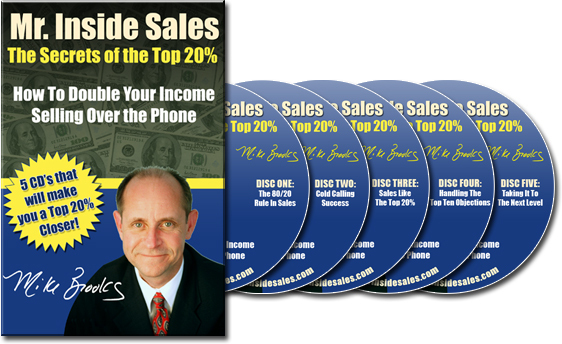 I recently purchased your disc set entitled "The Secrets of the Top 20% - How To Double Your income Selling Over the Phone". The CD set paid for itself almost immediately. I wanted to send you this note to let you know how much I enjoyed your CD Training series. I have held various sales and sales management positions for 25+ years - some with Fortune 500 companies. Yet, many of the tips and techniques on your CD were greatly beneficial to this "seasoned veteran". I especially enjoyed the section on "Cold Calling Success" which contained unique approaches which, when used consistently, truly do work. I highly recommend your CDs to anyone looking to become a Top 20% performer. Secrets of the Top 20% was simply one of the best and most practical sales courses I have participated in. I put my sales team through the CD series and the next month, they doubled the amount of appointments set and broke all company records. This is a must do training course for anybody responsible for selling or prospecting over the phone.